Mark Boda, Professor of Old Testament, B.Th. Ambrose University College received his Masters of Divinity from Westminster Theological Seminary and his Ph.D. from the University of Cambridge. Boda writes prolifically on on various topics related to the Old Testament and Christian Theology. Boda also enjoys mentoring students and teaches the Old Testament enthusiastically emphasizing its relevance in the world today. This book arrived at my door in a remarkably timely manner and I used it as reference material for my Thursday Night Bible Study class. In fact, I got so comfortable thinking of it as reference material, I almost forgot to blog about it. First off, this is not a book for the casual Sunday scholar. I struggled a bit with the structure, presentation and language of this text. I found that it often assumed knowledge I didn’t already have. However, I came to appreciate the book more and more as I stuck with studying it. 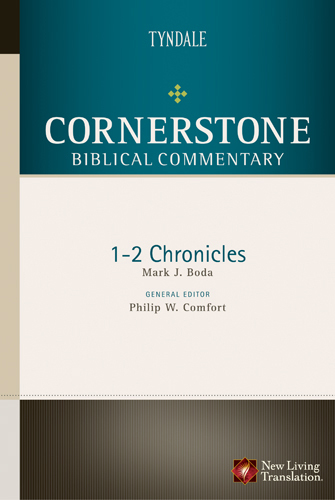 If you are serious about enhancing your Bible study, Tyndale’s Cornerstone Biblical Commentary can certainly help you do so. I very much appreciated the explanations and insights pinned to the Hebrew, Aramaic and Greek words. I also liked the wealth of history that one doesn’t get from simply reading scripture. Chronicles1 and 2 are no longer a boring list of endless ancestors to me, and I better understand why these two books are included in the cannon. Ooooooooo… this one is definitely going in my cart!! !